Packed with protein, flavorful & satisfying! This is the Queen of all salads and I am currently obsessed! I’ve literally made it several times its the last two weeks, and my husband and I devour it each time. A royal, gluten- free and plant-based take on the classic Caesar, it’s fresh tasting, packed with protein & flavor, and totally satisfying! 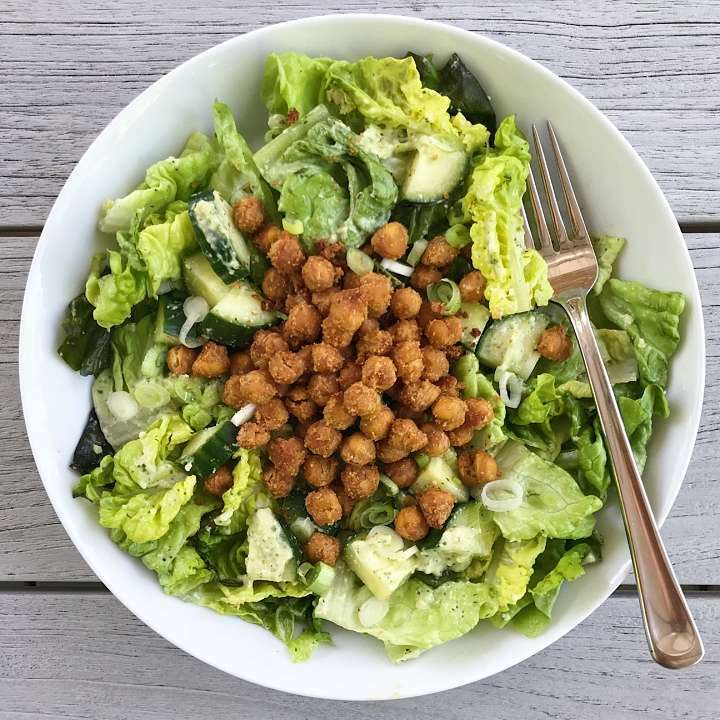 Recipe adapted from Simply Gluten Free by Ricki Heller, it’s a simple base of green leaf lettuce, english cucumbers and green onions, topped with Spicy Roasted Tahini Chickpeas and tossed in a creamy, planted based Herbed Yogurt Cashew Dressing. The combination is fresh tasting, packed with protein, melt in your mouth yummy and totally satisfying! More on the dressing… it’s made with coconut milk or cashew yogurt, raw cashews, cilantro or parsley, fresh lemon juice, garlic, a touch of dijon and EVOO and it thick, creamy and practically drinkable it’s so good. This salad is especially great and on repeat so much right now as we have so much fresh lettuce in our garden. In a large bowl, place the lettuce, green onion, and cucumber. Add dressing to taste and toss to coat. Top with Spicy Chickpeas.